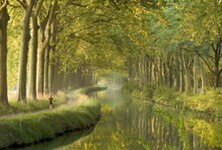 The Canal du Midi is one of the south of France's major attractions, and no wonder. This marvel of 17th century engineering created by Pierre Paul Riquet, a native of the Montagne Noir in the area, reaches from Toulouse (Toulouse Property Guide) to Sète on the Mediterranean coast, and is an official UNESCO World Heritage site. On its way through the Languedoc-Roussillon region (Languedoc-Roussillon Property Guide), the Canal passes a multitude of lovely towns and villages, many of which have become deeply popular with British property seekers for their picturesque setting. The Canal du Midi was constructed to transport the goods, primarily wheat, wine and textiles of the south of France to other areas before the arrival of good road and rail systems. Along with canals and rivers, the canal is part of the link between the Atlantic Ocean and the Mediterranean Sea, a vital resource in the 17th and 18th centuries. Pierre Paul Riquet, the inspired engineer who designed the canal, had to overcome many difficulties (not least of which was a shortage of water in the Midi area to feed the canal!) in order to bring the project to fruition, but overcome them he did, and the canal today, although now used purely for pleasure boats, stands as a proud example of his brilliance and tenacity. The canal is now a great source of pleasure for holidaymakers and residents who are lucky enough to live near to its cool beauty. The tree-lined tow paths provide welcome shade from the hot, summer sun for walkers and cyclists, while the calm waters are perfect for boating trips and holidays. British companies such as Crown Blue Line were quick to spot the potential of the Canal for pleasure use, and now the boating holiday trade is well established. Taking a trip down the Canal du Midi offers an unrivalled way to explore some of the prettiest parts of the Languedoc (The prettiest villages in the Languedoc), so step on board and discover some of the Midi's treasures. Although the Canal du Midi begins its journey to the Mediterranean in the city of Toulouse in the region of the Midi-Pyrénées (Midi-Pyrénées Property Guide), once it passes into the Languedoc, the first town of real interest along its banks is the old town of Castelnaudary (Castelnaudary Property Guide). The town, the acclaimed home of the cassoulet dish, makes an attractive stopping point along the canal, and is well worth exploring. Once a little shabby, Castelnaudary is intent on cleaning up its act and is developing into a lively and very attractive destination. However there are still some areas of town that sacrifice aesthetic merit for utilitarian purposes as the town relies on agriculture for it main income and operates large grain stores. There is a fairly large (although not overpowering) British community and social scene in and around the town, but should you choose to settle here you should make learning French a priority as many residents do not want to converse in English even if they can! (Learning to speak French - Misadventures in a Foreign Tongue.) That said, the local people are friendly and warm towards incomers, and the town has plenty of good shops, bars and restaurants to enjoy. The town also offers excellent schools for all ages (French Education System - Schools in France), medical services, sports facilities (Sport in France) and everything you could expect to find in a good sized town. It also serves as a garrison town for the French Foreign Legion, which is always a point of interest, and the military base provides excellent sporting facilities and tuition for youngsters and members of the public (French Sports and Sports Clubs in France). Castelnaudary has several lovely old buildings and monuments, but its main claim to fame, apart from cassoulet, is the Canal du Midi, which flows right through the town, and is home to the beautiful Grand Bassin, the seven-hectare lake that forms a base for the holiday cruisers all summer long. It is from a raft in the Bassin that the fireworks are sent into the sky on July 13th, the night before Bastille Day, and a very picturesque sight it is! Property in and around Castelnaudary (Castel to locals) can be found at quite reasonable prices, and there are opportunities to find everything from elegant townhouses to new villas or old farms on the outskirts of town. After Castelnaudary, the canal passes through the circulade village of Bram (Bram Property Guide), which is noted for its tragic Cathar history when all the townsfolk were maimed and blinded and led through the region as an example to those who did not adhere to the Catholic faith. The canal then passes a collection of pretty villages en route to the next major attraction, the fairy tale town of Carcassonne. This has to be one of the region's best loved towns, and its mediaeval walled city and castle are iconic images of the Languedoc. There are two parts to Carcassonne (Carcassonne Property Guide), and the Canal du Midi runs through the more "modern" town and past the foot of the ancient walled La Cité ( another UNESCO World Heritage Site to add to that of the Canal itself). The mediaeval city is the biggest draw for tourists, with its perfectly restored buildings, tiny cobbled streets, castle, exhibitions and shops and restaurants. It is at once beautiful and atmospheric, and cries out to be visited. However, if you are seeking a place to call home, whether it be for holidays or long-term living, you will be looking at the lower city, which is an extremely popular destination for many ex-pats and holiday home owners. Carcassonne lacks for nothing (except, perhaps, a coast) and offers all the facilities you could hope for. In addition to a great choice of shops, bars and restaurants there is a good golf course, an excellent hospital, a range of schools, colleges and lycées, sports complexes and all the usual service industries. The central part of the lower town is built to a classic bastide pattern, with the Place Carnot as the central square. From concerts to street markets (French market experiences in Languedoc-Roussillon) to festivals and Christmas fairs, there is always something happening in Carcassonne on the entertainment and cultural front, making it a fantastic city for lovers of French life. The canal is a wonderful central feature and property near to or along its banks is highly sought after. Property seekers in Carcassonne will find an enviable choice. The outskirts of town have extensive modern developments with a range of property available from luxury villas to inexpensive lotissement housing, while the centre offers a chance to find a stunning apartment in an historical grand home with period features bursting from every corner. Property here can be found in most price brackets, meaning there really is something to suit everyone. The canal now begins to wind its way slowly towards the Mediterranean, with the passing countryside changing all the time. Vineyards are ever present (French properties with vineyards), of course, as this is the largest wine producing region in France, but a distinctly Mediterranean ambience kicks in after Carcassonne, with the landscapes becoming more arid and the weather even hotter and sunnier than before. Trèbes is another worthy stopping point on this journey to the sea and no doubt of interest to second home buyers. It is a very picturesque mediaeval village, set on the banks of the canal, and has a lively little marina which is always a buzz with activity in the summer months as the boats moor up for their occupants to take a wander around, buy in provisions and grab a spot of lunch or dinner. Here there is a supermarket as well as all other shops, and plenty of places to eat and drink. English people are well catered for in the town with an English language bookshop... a rarity outside the big cities in south-west France! Sights in the town include a 13th/14th century church and plenty of original streets and buildings. Cultural events include summer night markets, open air concerts and various fetes and festivals (Festivals in France - celebrate the Languedoc-Roussillon way!). Once you pass Trèbes, you will be treated to the sight of a dazzling selection of gorgeous little villages, all and any of which are lovely resting points as well as lovely locations for rural second homes, should any come on to the market. Marseillette has mooring places and village facilities such as bars and bakers, while the village of Puichèric, set in the Minervois vineyards (Minervois Property), has a castle and good amenities, with shops, restaurant, wine caves and general services. Both villages are small but very attractive and close to larger towns for comfortable living. La Redorte is also delightful. Once more, it is little more than a good sized village, but its canal-side location, its Vauban designed "epanchoir" (overflow bridge), its festivals and overall charm make it a very desirable location for property seekers. The village has a selection of shops and other amenities. Homps is another pleasant stopping place, with the added attraction of a leisure lake for water sports should you fancy a change from gentle cruising or walking! Next up is Argens Minervois, one for lovers of historic atmosphere, where the old cobbled streets and mediaeval chateau call for your attention. Roubia, Paraza and Ventenac en Minervois then follow along with Le Someil, which charms with its pretty quayside and its floating bread shop! Then as the department of the Aude heads towards the border with the Hérault, the villages of La Robine and Argeliers are found on the canal's banks. Greeting you in the Hérault (Hérault Property Guide) is Capestang. Capestang (Capestang Property Guide) is an attractive market town (open air markets Sundays and Wednesdays) with a good deal of heritage in addition to a lively atmosphere and a number of enjoyable festivals. Two more villages (Poilhes and Colombiers) pass by before the canal brings you to the next place of real note, the Cathar city of Béziers. Béziers (Béziers Property Guide) is one of the Languedoc's major cities, and hugely popular with both visitors and British property owners. The climate of the Hérault is among the best in France, and this sunshine city has a long and fascinating history to add to its attractions. Once this city was a staunch stronghold of the Cathar religion, but it was besieged and attacked by the Catholic crusaders, the church burnt to the ground and many of the people massacred. Although Béziers has never forgotten the tragic events of its past, it is a thriving and delightful city today, culturally rich and extremely sought after by ex-pats of an artistic nature, with a very high number of writers in particular, numbered among the British residents. Béziers is well equipped with all manner of shops, modern services and entertainment, and the opportunities to enjoy the Languedoc's celebrated gastronomy (Languedoc Food - a serious subject!) are numerous with a host of excellent restaurants in the city. Property in Béziers comes in a range of forms and at a range of prices. In the city, apartments can be found at reasonable rates, while houses are rather pricier. On the outskirts, luxury villas and old wine grower's houses are always sought after, but it can be difficult here to find properties with much in the way of outside space. However, you could always buy a vineyard, as this is a region where almost every available piece of land is thus used! Why not consider property in Villeneuve les Béziers? 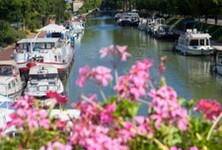 Should you like the idea of living close to the city facilities of Béziers but not want to pay city property prices, or need a little more outside space, the next of the canal bank villages, Villeneuve les Béziers, is well worth a look. Within easy commuting distance of the city, this village is well equipped with amenities of its own, and makes an attractive and peaceful place to settle. Portiragnes (Portiragnes Property Guide), next in line, is lovely and a very typical village of southern France, and connects with its seaside counterpart, Portiragnes Plage (Portiragnes Plage Property Guide), where all the fun of the Mediterranean is on hand. Port Cassafiers is, as its name suggests, a canal port village, pretty but small, while the next village Vias, is one of real potential for property seekers. Vias is a village rather than a town, but a village of robust proportions and with plenty of facilities (Vias Property Guide). Shops, restaurants and a character-filled old centre are among the attractions. Just to the south, Vias also presents its sister village, the resort set on the Mediterranean Sea. Property in Vias starts with village houses at around 150,000 Euros, so although it is more expensive than some parts of the Languedoc, it is within the grasp of most. The canal brings you now to another major point, the old town of Agde (Agde Property Guide). The name of Agde is most commonly associated with the beach resort of Cap d'Agde (Cap d'Agde Property Guide), famed for its lively attitudes and nudist beaches, but the old canal-side town is a different cup of tea. Agde is simply beautiful, with an historic centre, oodles of heritage and a great selection of shops, bars and restaurants. Of course, should you wish to access the vibrant holiday resort on the coast, it is but a short hop away. The scenery now is seriously Mediterranean, and it is at Agde that the canal reaches the salt lagoon of the Etang de Thau. Agde is also an important harbour for the canal boats, and becomes very busy in summer time. It is, of course, another very desirable destination for property seekers, being ideal for holidays thanks to the twin attractions of the coast and canal, and a dream location for those wanting to adopt a Mediterranean way of life on a long term basis. Property prices therefore are high, but still generally representing better value than in much of nearby Provence. Finally, at the end of the canal (an arguable point, as the canal, if it can still be called a canal at this point, runs a path through the Etang de Thau) is the lovely town of Sète (Sète Property Guide). It is famed for its fishing port, its canal-based carnivals and jousting competitions, its sun-drenched beauty and its supremely privileged location beside the Mediterranean Sea, the Etang de Thau and the Canal du Midi, three of the Languedoc's most celebrated features. Whatever you want to do on holiday or with your leisure time, Sète effortlessly provides. There is an open air Theatre of the Sea, there are museums, sports clubs and facilities, schools, services, shops and restaurants with an especial emphasis on the fabulous seafood for which the Etang de Thau is famed. From Sète, the Canal du Midi becomes the Rhone Sète Canal, bringing our journey along the Midi's marvel to an end. However, don't miss out on the fabulous villages that are set around the Etang, which may not, strictly speaking, be canal-side villages, but are close enough to count! Places such as Bouzigues (Bouzigues Property Guide), Meze (Mèze Property Guide) and Marseillan (Marseillan Property Guide, Marseillan Plage Property Guide) are among the most stunning and delightful in the region, so to make the most of any trip down the Canal du Midi, make time to discover them. You never know, you may never want to leave.